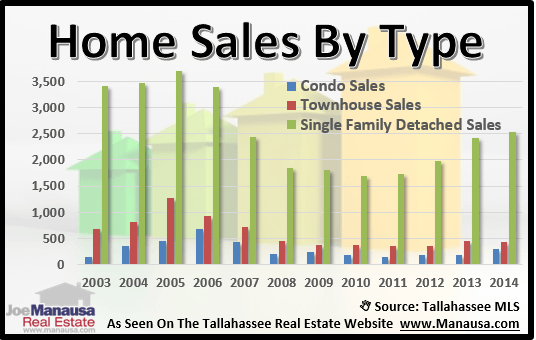 On a day that we are reminded that nothing in life is free, I would like to present our readers six tax day freebies in the form of real estate graphs that clearly demonstrate current trends in the Tallahassee real estate market recovery. We will take a close look at property types and distressed home sales, which should provide homeowners with an understanding of what is happening to the value of their homes. Our first tax day freebie contains information that you need to know if you are getting ready to sell a home, buy a home, or invest in the Tallahassee real estate market in any way. This graph clearly shows that distressed home sales are on the rise, as roughly 1 in every 3 transactions is a short sale, foreclosure, or bank owned property. This is tough for existing homeowners, because that means a full third of their competition just wants to get rid of the property, and the sales price is a secondary consideration. Those distressed properties are keeping buyers active, as the first quarter of 2014 out-performed all years prior going back to 2008. 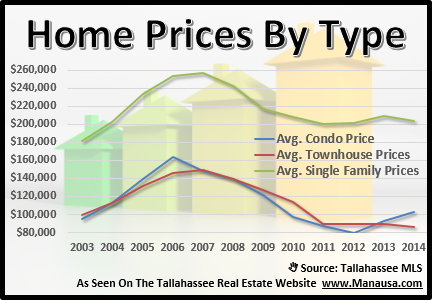 The major question that looms for the Tallahassee real estate market is how many more distressed properties need to clear the market? We have to wonder whether a flood of properties is waiting around the next corner, or perhaps will their be price-shock for buyers coming soon if we conclude the cleansing of the market. Condominium Values On The Mend? 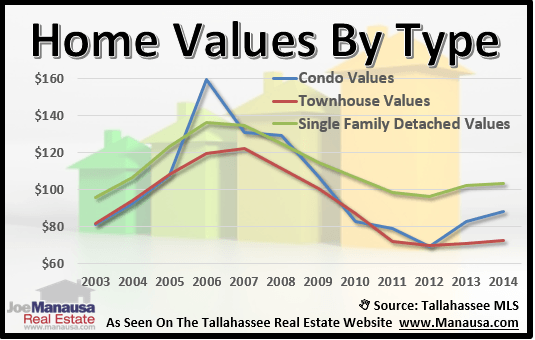 2014 has delivered lower values for single family detached homes and townhouses, but condominium values have shot upwards. 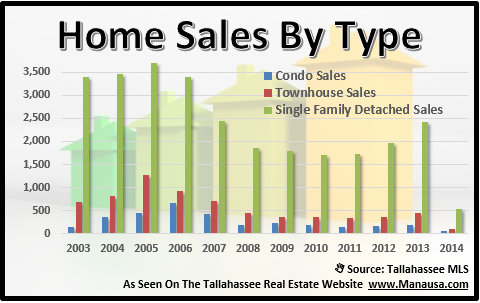 This is less a move in market values, and more a picture of what happens in a low liquidity market (condo sales in Tallahassee) when product mixes change. The fact is we are seeing some of the downtown market wake up, and with so few condominiums sold, their impact on "average" condo values is very clearly fogging our results. Single family detached home prices and values are coming down thus far in 2014. So too are townhouses. I suspect this is nothing more than a normal blip in an upwardly moving market. 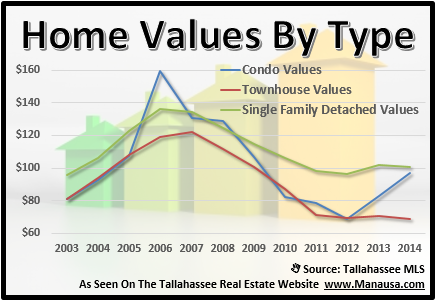 Values and prices soared in 2013, it is only logical that we would see some regression as distressed home sales "confused" buyers. When we see distressed sales begin to decline, you can expert this short term reprieve to reverse. The difference between arms length home values and distressed home values was at its widest margin last year, and buyers are being pulled to values in short sales and foreclosures. This has caused competition for distressed properties and we are seeing values rise, while it has reduced the competition among arms length sellers, thus values are under pressure. 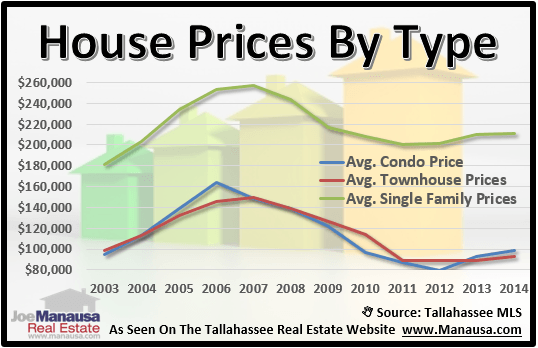 Our final tax day freebie shows that the majority of distressed properties that are selling are below the median home price in Tallahassee. This means that when we compare the average prices and values of distressed properties with those of arms length properties, we are not really comparing apples to apples. Investment properties still dominate the distressed sales, so we have to take these relative images with a grain of salt and ensure that we do a detailed evaluation for every specific situation for which you find yourself. Never apply market averages directly to your specific scenario, adjustments need to be made. OK, I admit, free pictures of the housing market weren't nearly as good as your federal tax liability was bad, but ... we tried :). If you want to know how to use the information from your 6 tax day freebies to make a move in the Tallahassee real estate market, just drop me a note and we will schedule a time to review your specific needs and wants, and then get you moving!